Business expositions can be huge, and people often don’t have the time to visit every booth. That’s why you need to ensure you stand out from the crowd if you want to be approached. We spoke to Karen Cutmore, Sales Manager from TFH Gazebos, who told us how you can encourage an interest in your brand at trade fairs. 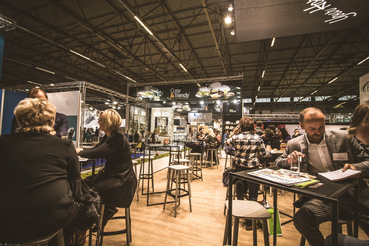 Trade fairs offer a great opportunity to get your name out there but, when you’re competing with so many other businesses, what can you do to make yourself stand out and encourage people to approach you? In this article, I’ll be giving you my four top tips to make your exposition booth more appealing to passers-by. A lot of businesses at these events tend to use the empty shells provided by the venue, but this just makes them look like everyone else, and people are more likely to simply walk past. It’s important that you design and prepare your stand before going to any exhibition, as you can then figure out the best way to make it stand out from the rest. Pop-up gazebos are perfect for expositions, especially when you get them printed with your branding. Your stand should be covered in your logo so you can advertise your name and raise awareness of your brand ethos. It also shows that you’ve gone the extra mile, which means that potential customers are more likely to trust you to do a good job. Want to get people talking about your brand? Why not host a competition? This will encourage people to approach your booth, and generate a discussion around what products and services you offer. As part of the entry process, you can ask people to sign up to your mailing list, which gives you a great opportunity to stay in touch with people you meet and let them know about anything new that they might be interested in. Who doesn’t love a free pen? Giving out branded freebies encourages passers-by to approach your stand, giving you an excellent opportunity to start your sales pitch. Consider investing in more unique items that people are going to want to keep for a long time, like bottle openers, power banks, and USB sticks. By having your merchandise circulating for a long time, you’re increasing the number of people who are going to see it. If you’ve followed these first few steps, you could have a lot of people coming over to your stand to find out more about your business. But what do you do if you’re already busy talking to someone else? To keep these potential customers interested, create a video about your company that you can have running in the background. People should be able to find out exactly what it is you do and how you can help them. This means people will be less likely to just walk away when they see that you’re busy, and it’ll attract the attention of those walking past, too. It’s easy to get lost in the sea of branding at trade fairs, which is bad news when you’re wanting to make an impact and boost your sales. But, by taking these easy tips on board, you can make your booth stand out from the rest and encourage more of an interest in your brand.